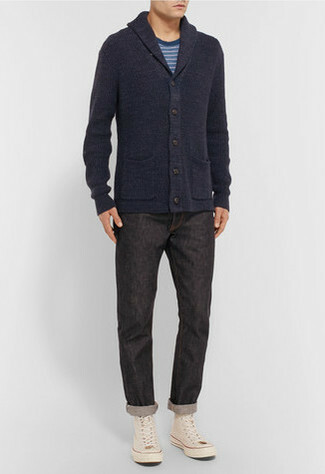 If you're on the hunt for a casual yet on-trend look, team a Rag and Bone rag bone donaghy shawl cardigan navy from Bergdorf Goodman with navy skinny jeans. Both garments are totally comfortable and will look great together. When it comes to footwear, this ensemble is complemented wonderfully with white low top sneakers. If you're on the lookout for a casual yet stylish outfit, pair a Rag and Bone rag bone donaghy shawl cardigan navy from Bergdorf Goodman with navy jeans. Both items are totally comfortable and will look great together. Dark brown suede desert boots are a wonderful choice to complement the look. If you want to look cool and remain cosy, consider teaming a Rag and Bone rag bone donaghy shawl cardigan navy with light blue ripped skinny jeans. To add elegance to your look, complement with white leather low top sneakers. 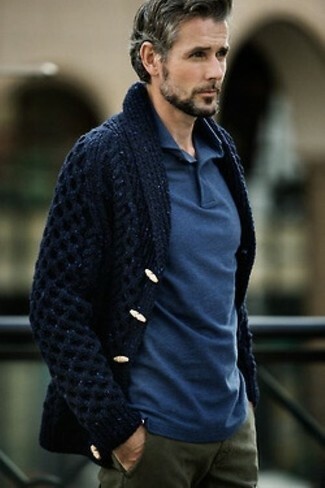 This combo of a navy shawl cardigan and black chinos is very easy to make up in next to no time, helping you look stylish and ready for anything without spending a ton of time combing through your closet. 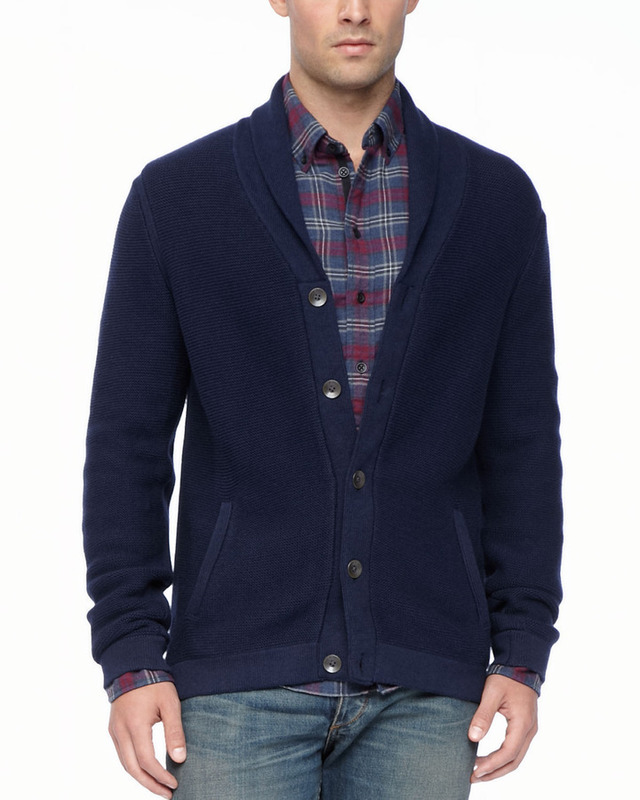 This combo of a Rag and Bone rag bone donaghy shawl cardigan navy and beige chinos is so easy to put together without a second thought, helping you look sharp and ready for anything without spending too much time searching through your closet. Make brown leather double monks your footwear choice to take things up a notch. As you can see, getuping sharp doesn't require that much effort. 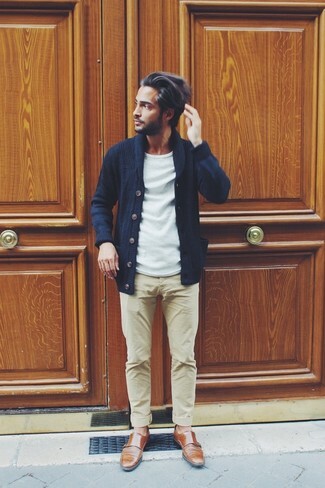 Just opt for a Rag and Bone rag bone donaghy shawl cardigan navy and olive chinos and you'll look amazing. 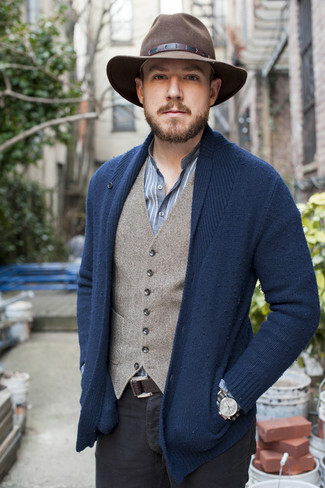 Dress in a Rag and Bone rag bone donaghy shawl cardigan navy and charcoal dress pants for a sharp classy look. 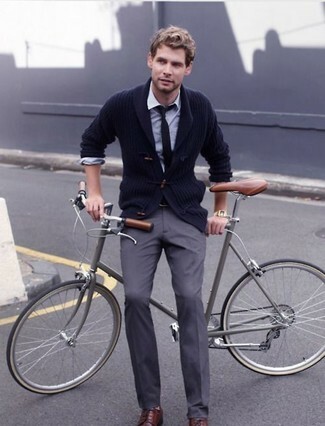 For something more on the daring side to round off this outfit, throw in a pair of dark brown leather derby shoes. If you're after a casual yet sharp outfit, consider pairing a Rag and Bone rag bone donaghy shawl cardigan navy with khaki jeans. Both items are totally comfortable and will look great paired together. 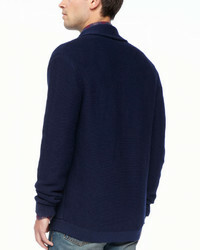 If you're scouting for a casual yet seriously stylish getup, pair a navy shawl cardigan with black jeans. Both garments are totally comfortable and will look great together. For something more on the daring side to finish off this look, opt for a pair of beige canvas high top sneakers.